The Samsung Galaxy S4 may currently be hogging the headlines after being revealed last week but the Galaxy S3 is still a very decent handset indeed. The Galaxy S4 is due for release next month, which means there are now some really good price deals for the Galaxy S3. 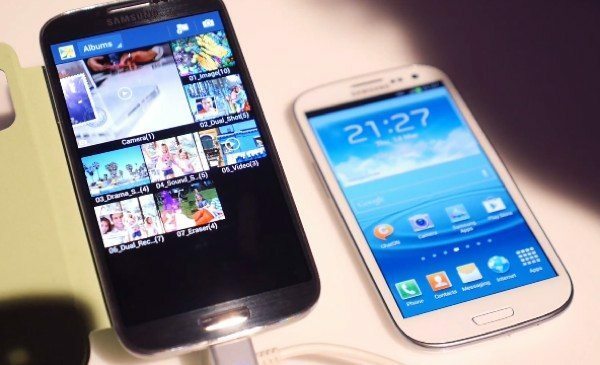 We thought we’d give you a look at the new Samsung Galaxy S4 vs. older Galaxy S3 with a video comparison that could help you make up your mind if you’re undecided between these two Android smartphones. We’ve previously given you a specs comparison of the Galaxy S4 vs. S3 but sometimes we’ve found that a video can speak a thousand words. Seeing the handsets in the flesh, so to speak, can be a deciding factor and one thing the video certainly shows is how similar they are physically, with it being very difficult to tell which is which, especially at first glance. The video cleverly describes the Galaxy S4 as “more of everything except for what less of what you don’t want,” and goes on to point out the lighter weight of the Galaxy S4 to the Galaxy S3 (though not by much). The video then goes on to describe positives of the Galaxy S4 such as Android 4.2.2 instead of 4.1.2 for the Galaxy S3. Some benchmarks were also run where the performance of the Galaxy S4 far surpassed that of the Galaxy S3. The video goes on to look at the cameras, the displays (with a dramatic ppi increase for the Galaxy S4) and features and clearly shows the Galaxy S4 is a pretty big step up specs-wise from the Galaxy S3. The Galaxy S3 is still a great smartphone though, even though it may be showing its age a little so if you want to save cash and don’t mind not having the very latest specs then you may well decide to take advantage of some of the current price cuts for the Galaxy S3. You can see the three-minute YouTube video that we’ve embedded for you below this story. We’d really appreciate it if you could let us have your comments after you’ve viewed the video and tell us which you might choose. Will it be the all-singing all-dancing Galaxy S4 or maybe you’ll choose to save some money with the Galaxy S3? Excellent comparison video, made my decision much easier in a short amount of time.